I rarely post quotes in these posts. I just like to share the inside stories, the aha moments, and the lessons. Today I am posting a quote that I really feel is necessary for everyone to read. 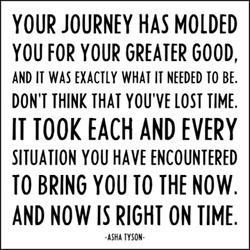 Sometimes our journey seems as though it has been a waste of time based on those who we feel have come in and robbed us of some of it or because we did not act when we could of to change the course of our lives. Trust me, neither one of those things are true. Read this quote below and see how it affects you.